In general, I like to think that I’ve got a green thumb. I’ve grown many things in my garden including corn, kale, carrots, and beets. But there’s one category of plants that gives me pause: houseplants. The truth is, I’ve killed a fair number of houseplants in my day. 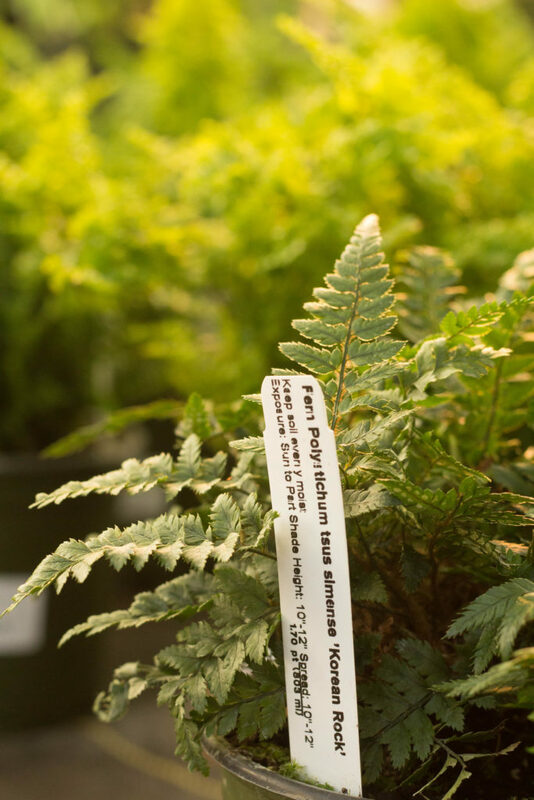 I recall one colorful episode in college where I managed to kill a fern and decided to bring it back to the Queen Anne nursery I’d bought it from in hopes they could help me resuscitate it. I remember handing it to the young clerk who I swore was about to shed tears when she’d seen when I done. Yeah, it was a goner. So for years, I’ve avoided houseplants (except the silk variety). No sense setting myself up for failure, right? However, as the winter months have marched on (it’s snowing as I compose this post today) and I’m starting to get the itch for the garden, I’ve contemplated my houseplant issue again. Is it possible, I wondered – that my past failures are because I just wasn’t selecting the right plants for me? 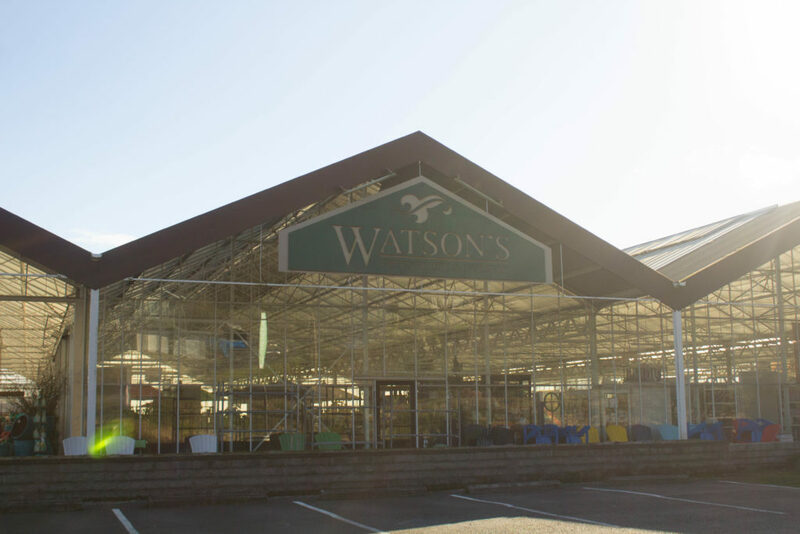 I decided to reach out to the folks at Watson’s Nursery in Puyallup for some help. 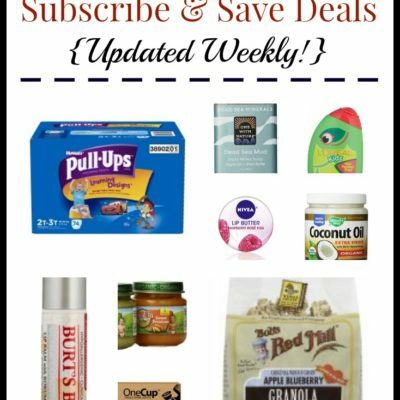 Full disclosure here: today’s post is in no way sponsored by Watson’s. I purely reached out to them as the experts here so I could pull together this post and I hope, help some of you that have felt in the same boat with this whole houseplant killing business! I met with Sherrie at Watson’s, who was both friendly and knowledgeable. 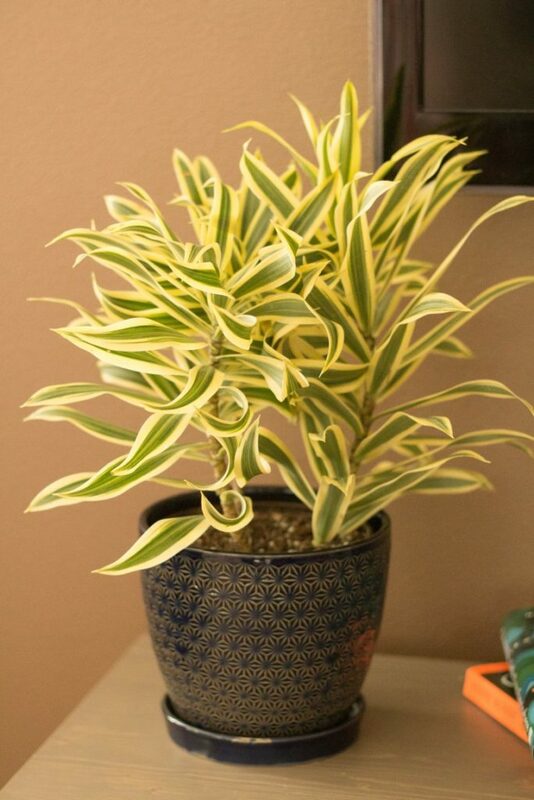 Here are a few good tips she gave me about caring for houseplants. The first question Sherrie asked me is if I tended to over-water or under-water plants. This was a no-brainer: I under-water! I can get busy and forgetful and before I know it, the plant is dead, dead, dead. 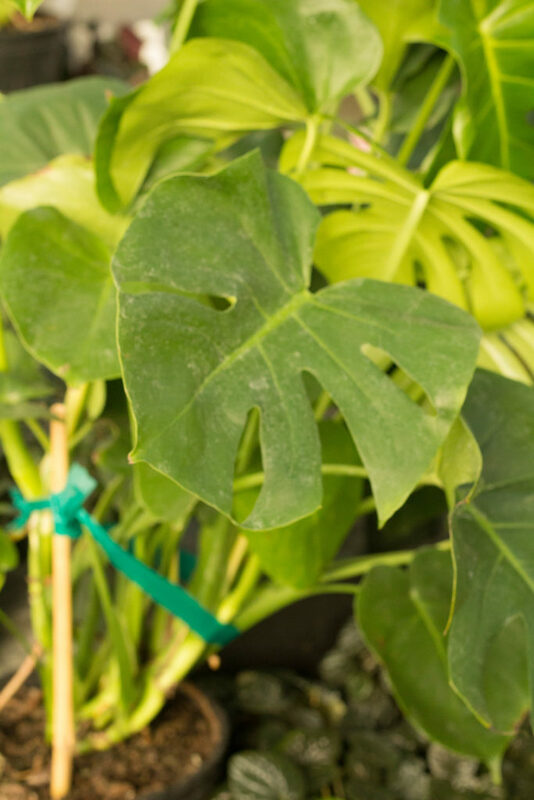 Philodendrons. These are nice, big leafy plants. 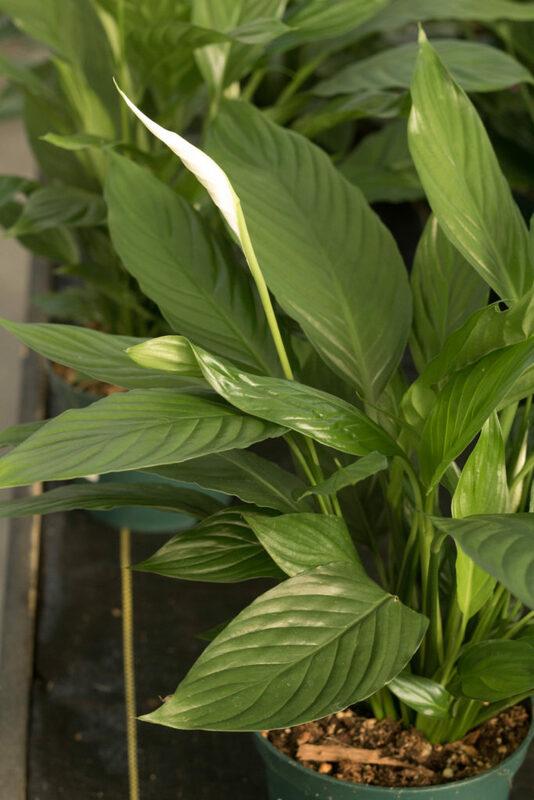 Peace lily. 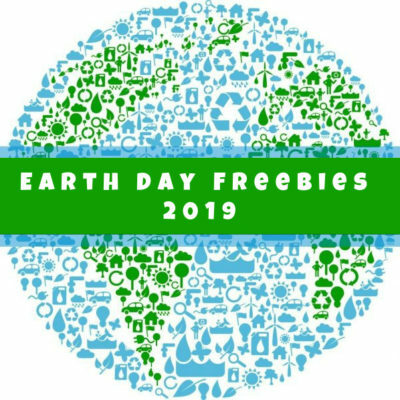 Sherrie also shared with me some information about houseplants and their value in purifying the air, and the peace lily just about ranks at the top! Palms. This is one of those things that seems so obvious when you think about it – after all, where do palm trees normally live? The desert! Where they don’t get much water! Cacti. Another obvious choice if you just stop and think about it. 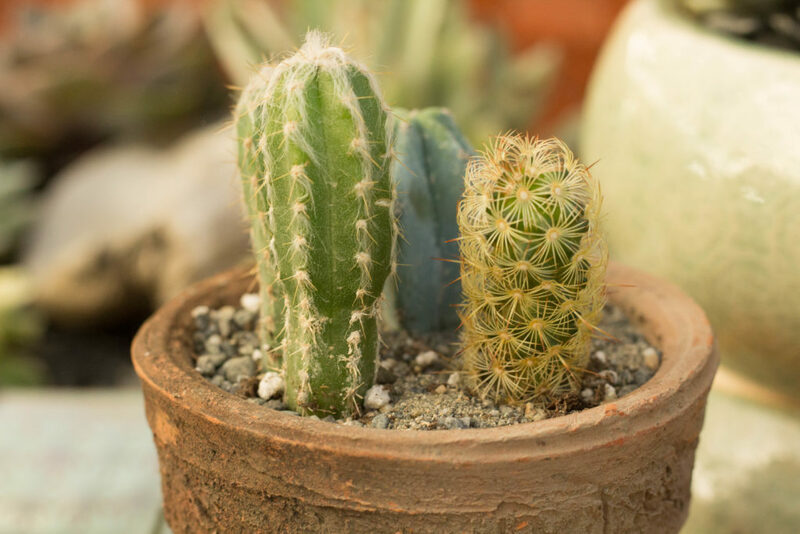 However – you should still make sure to give these guys a water once a month or so. 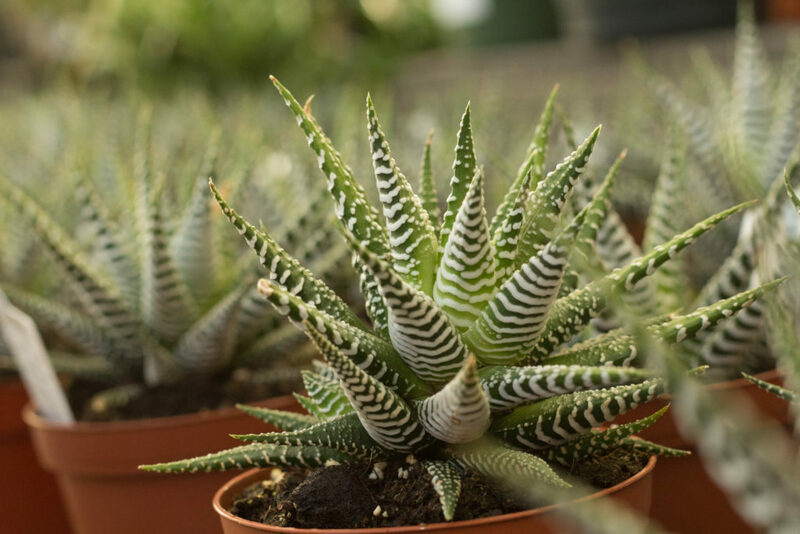 There are a surprising variety of other houseplants that fit squarely into this category. Ferns. These love moist, damp soil. Think about where you typically find them in a forest – growing near streams and along wet trails. Given this, they’d also do well in a bathroom or kitchen – or any room that may have high humidity. 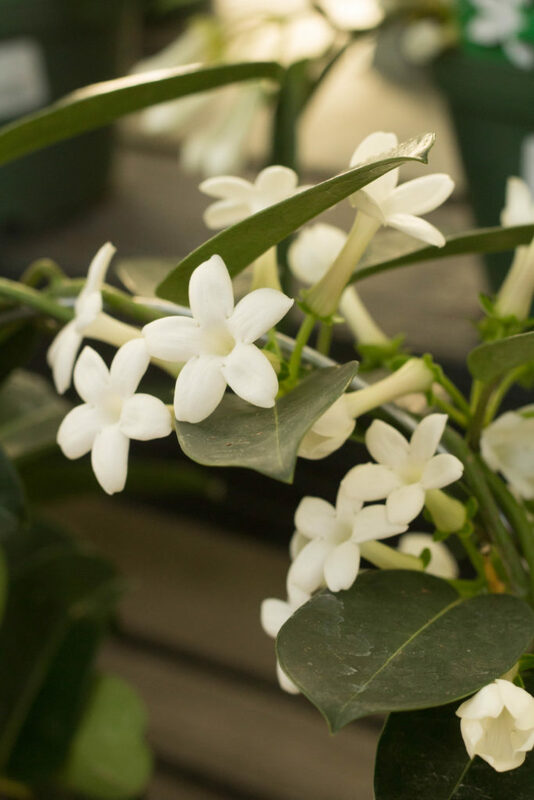 Jasmine and vining plants. 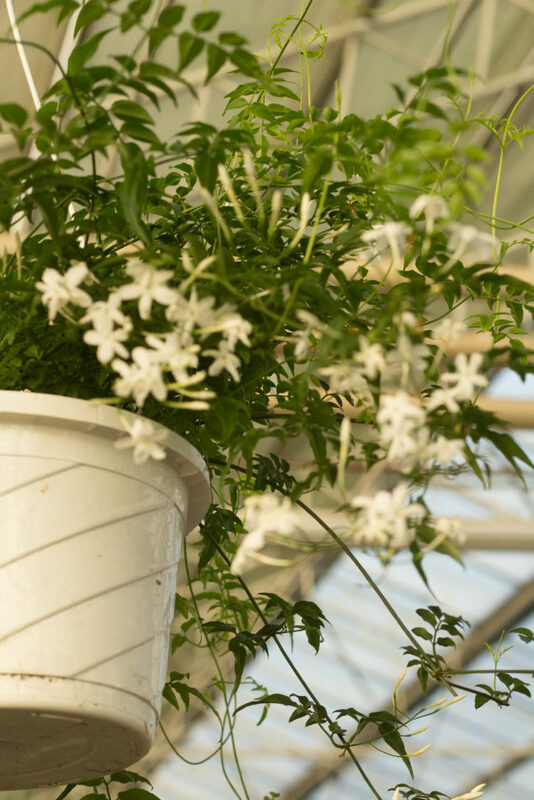 I was actually surprised to consider growing jasmine as a houseplant. Watsons had some growing on small looped trellises as well as hanging from pots. While they could certainly keep growing and growing, you could just as well trim them and they’d be happy as a clam. Terrarium Dwelling Plants. 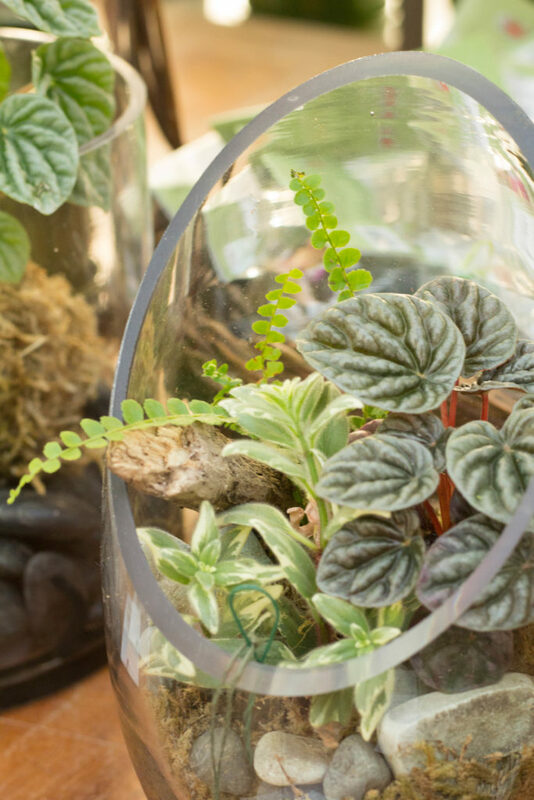 Small plants that do well in terrariums tend to do well with extra moisture, too. Watson’s sold small plants and elements for those inclined to make their own as well as some attractive, pre-assembled terrariums. You can just keep trimming them to keep them a neat and tidy size. I asked Sherrie if it’s best just to read the plant tags to figure it out if they need a lot of water or not much at all, and she surprised me when she said “no.” Many nurseries, such as Watson’s, source from a variety of growers. This means that care instructions may vary. So while you can use them as a general rule of thumb, always feel free to ask knowledgeable staff. It’s also worth taking some time to think about where you’re placing your plant. Will it be in a sunny window or sunroom? Or will it be on a mostly shaded area? 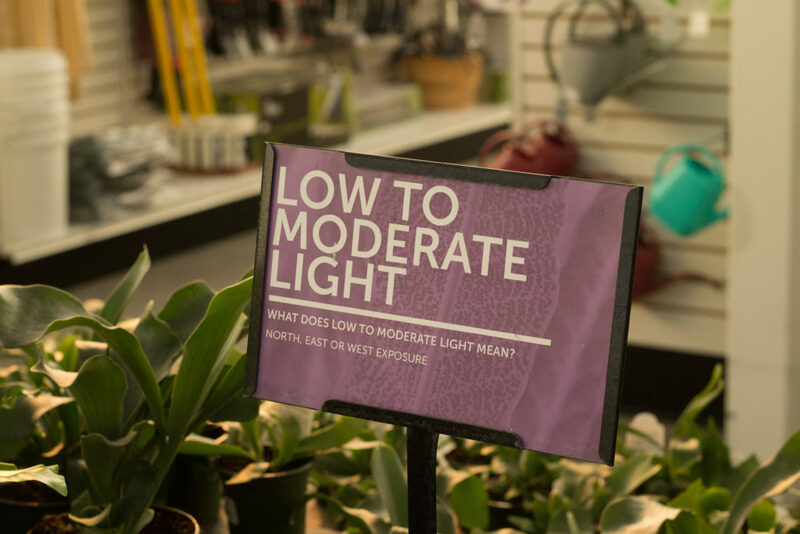 There are lots of plants that do quite fine in low to moderate light – think of our ferns, and philodendrons again. 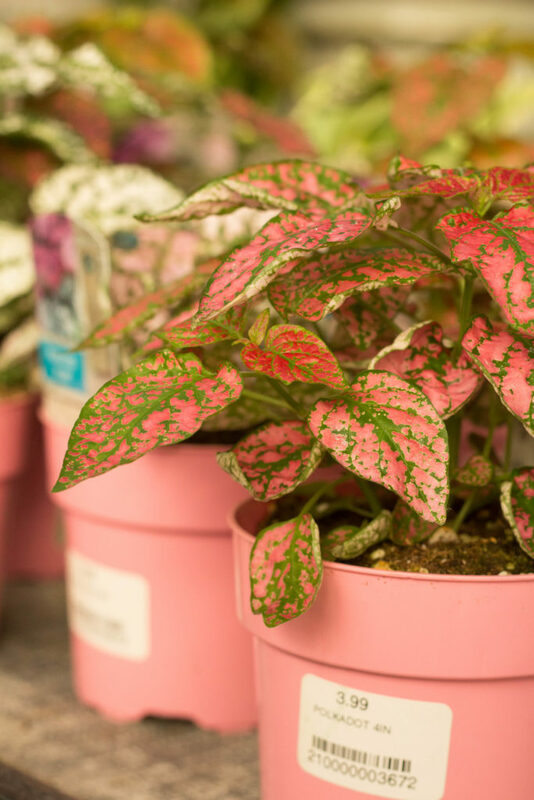 Others, such as this polka dot plant, will do best in a bright, sunny room in your house. One of the biggest take-aways from my interview with Sherrie is that if you select the right plant for the right spot, you shouldn’t need to do much. 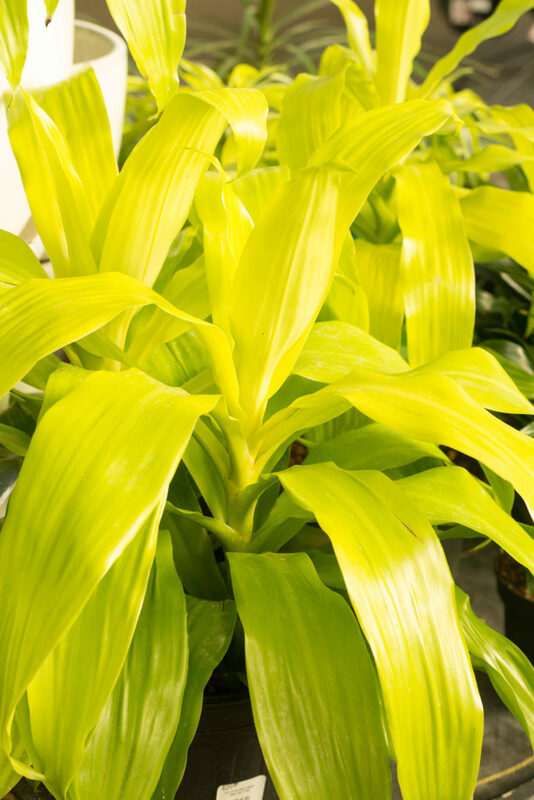 Much like garden plants need time to acclimated, houseplants do too! I had never considered this before, but it makes a lot of sense. If a plant has been happily thriving in a bright greenhouse like Watson’s, it may take a few weeks for it to adapt to the environment of my dark living room. Given this, you don’t want to do too much else to the plant to stress it further. For instance, one mistake I know I’ve made is to repot a houseplant right away into a much bigger container. 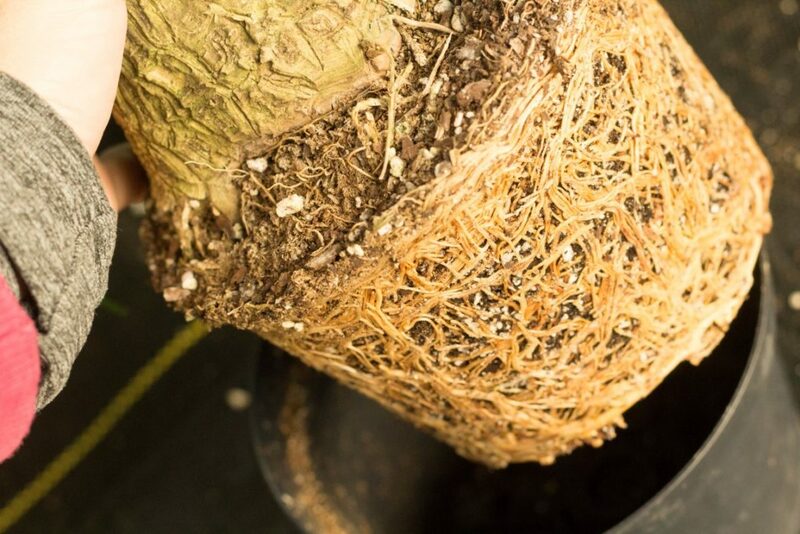 But when it comes to houseplants, most do well when their roots are tighter in the container. Sherrie explained that when the roots are about halfway up the dirt ball, it’s time to re-pot. Even so, go up only a size or two. Keep it comfy. 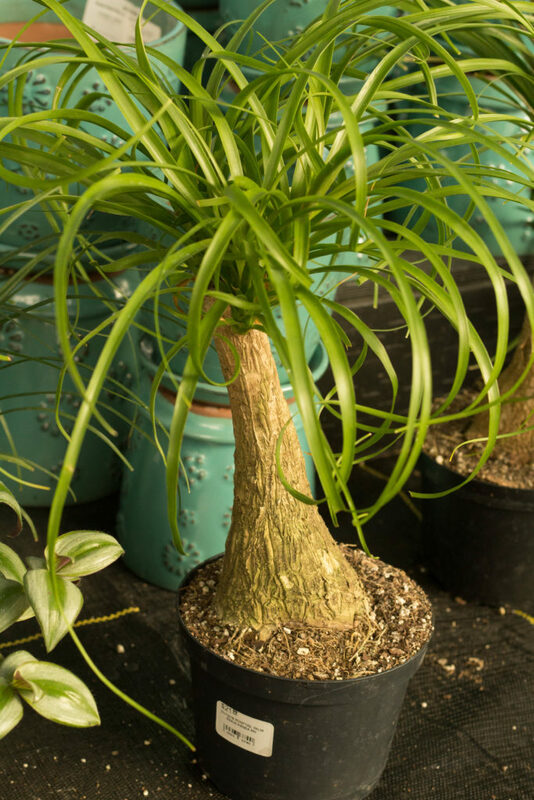 The above photo is from a ponytail palm she showed me that would definitely be ready to be repotted. 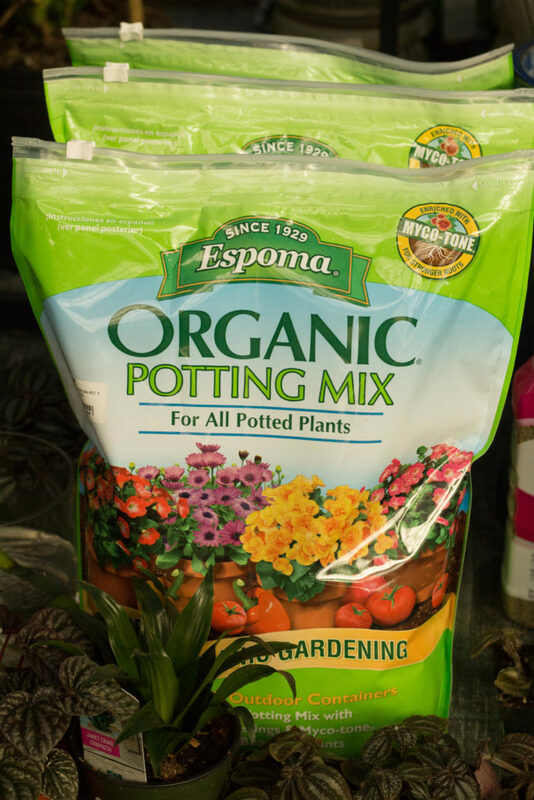 As for fertilizing, once every 6 months is sufficient for most houseplants. 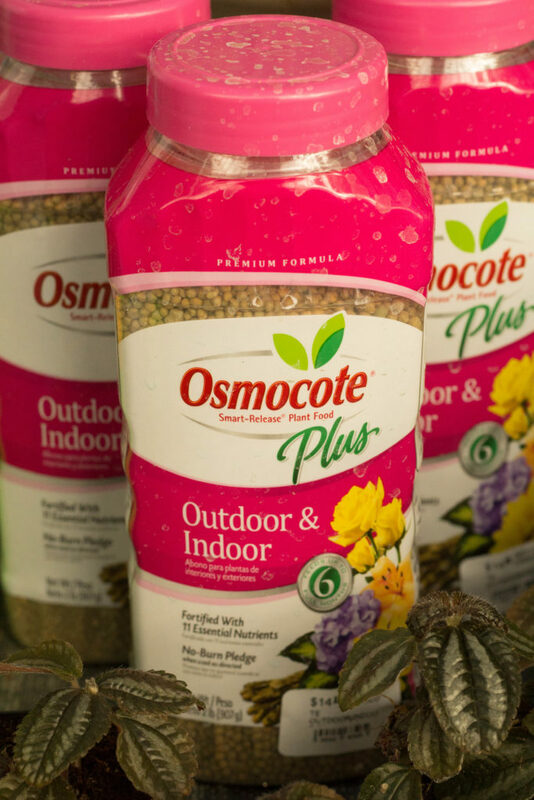 Sherrie recommended Osmocote Plus. 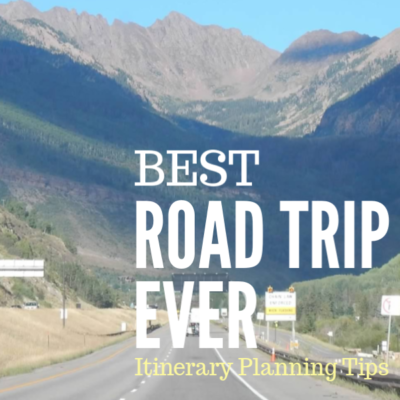 Ok, ok… so this last tip is my own, but I think it’s worth saying. 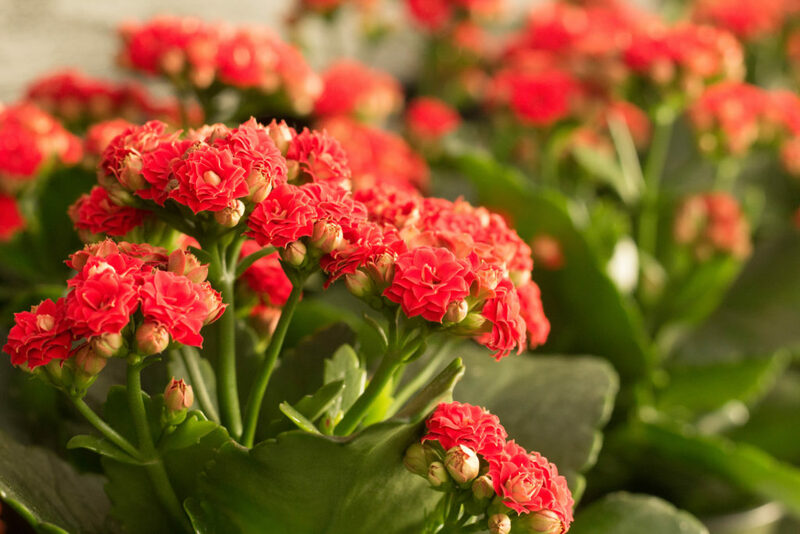 Once you’ve figured out the watering and light, you should also give consideration to what you want the plant to accomplish in the room. For instance, maybe you have a dark room that’s just calling for a bright splash of color? 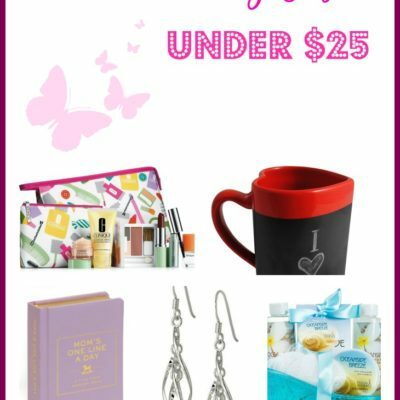 Or maybe you have an end table next to your favorite reading chair that would benefit from some fragrance? Sometimes flowers are just the ticket to spruce up an otherwise drab bedroom. Armed with my new information, I decided to purchase three houseplants for my house. 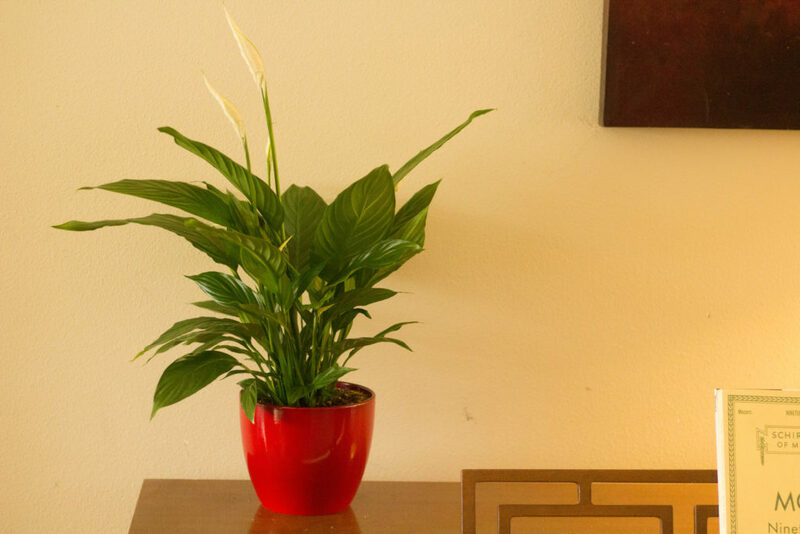 I chose this houseplant that requires low light to add a punch of color and light to a dark room. I decided to put this peace lily on the piano. 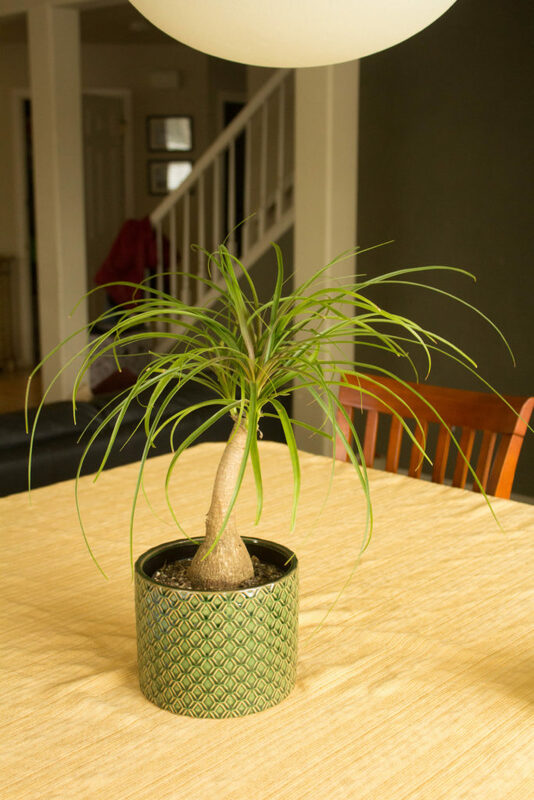 This palm got a bright and sunny location on my dining room table. I hope this post has inspired some of you to get out there and give houseplants a second try! I’d love to hear your stories! 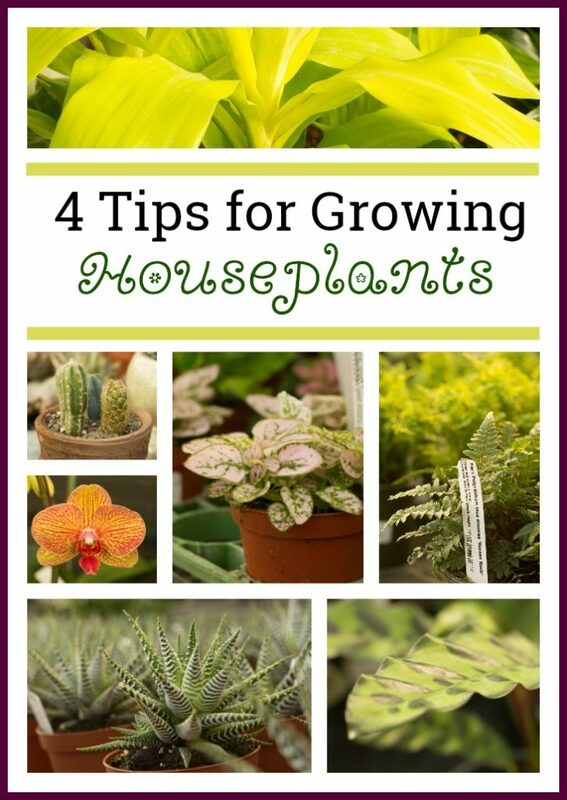 Have you successfully grown houseplants? Which are your favorites? Any additional tips you’d add to my list, or specific plants you’d recommend to those of us with less than green thumbs? Please leave a comment below. Great info! I don’t currently have any houseplants, but maybe will be inspired to try and grow some. Yours are cute and I love your pots.